* Excellent skin conditioner & moisturiser. * Encourages natural suppleness & elasticity. * Reputed for its anti-inflammatory properties. * Help to smooth wrinkles & fine lines. * Great for dry hair, dry scalp & dry skin. * Deeply penetrating & easily absorbed. Jojoba is not an oil but a liquid wax. A cold-pressed oil whose chemical composition resembles that of the skin's own sebum. This means that it is highly penetrative and encourages the skin's natural suppleness and elasticity. Excellent skin conditioner and moisturiser. Containing myristic acid, which reputedly has anti-inflammatory properties; it can also help to smooth wrinkles and fine lines. It's great for dry hair, dry scalp and dry skin since it is deeply penetrating and easily absorbed. Excellent for psoriasis, acne and eczema, it is very balancing oil. 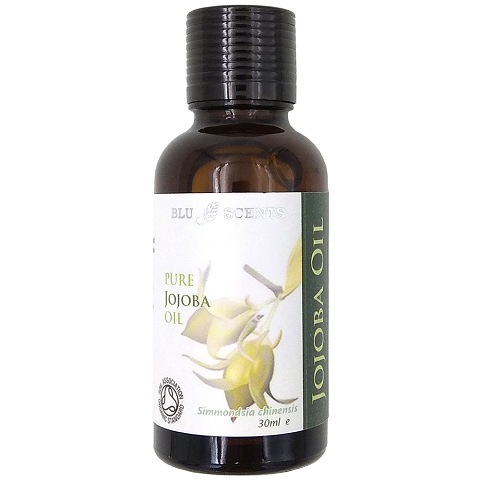 Pronounced [hohoba], Jojoba originated in the Sonoran Desert of Southern California and was used extensively by the Native Americans for cosmetic and medicinal purposes. As skin ages, it becomes less elastic, lines and wrinkles may start to appear. 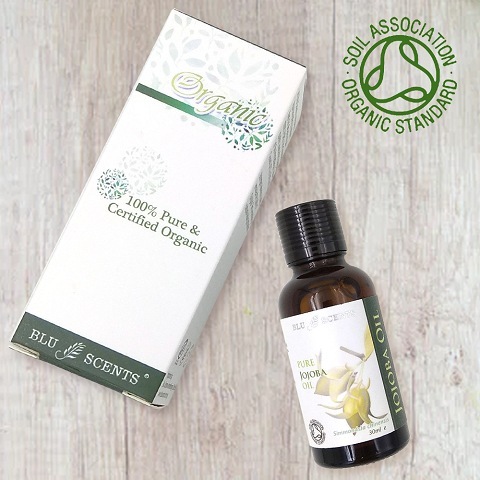 A combination of this light-textured carrier oil and essential oil is excellent for helping to preserve the youthful appearance of your skin, for rejuvenating mature skin and regeneration of new skin. For massage, mix 6 drops of Blu Scents' Pure Essential oils with 10 ml carrier oil. Warm the blended oils between the palms of your hands, and then massage straight onto the skin, using palms and fingers to distribute them evenly over the body, applying extra pressure to work tired or tense muscles. For hair massage, blend 4 drops of Blu Scents' Pure Essential oils with 10 ml of jojoba oil. To dissolve them thoroughly, turn the bottle upside down a few times & then roll it briskly between your hands. Dispense few drops onto your finger, then rub all your fingertips together to distribute the oil, and then massage gently onto clean scalp with your fingertips. The best time to do this is after shampooing, while your hair is still damp. Damp your hair, rub in jojoba from root to tip, then wrap in a hot, damp towel around your hair. Leave for 10 minutes then wash out with a small amount of shampoo. * Not considered dangerous. Edible quality.